The popular chicken joint has become one of America’s favorite drive-thrus. Chick-fil-A is known for its exceptional service, delicious nuggets, and friendly faces but there’s one thing customers don’t love about the joint. Chick-fil-A is closed on every Sunday, only rarely opening for special occasions. The Sunday tradition dates back to 1946 when the founder, Truett Cathy, wanted employees to honor the day to rest and worship. Remembering Truett Cathy today, the Founder and CEO of Chick-fil-A. He passed away 4 years ago today. Thank you for your Legacy. Fast forward to 2019 and the tradition still stands strong! But one teen got the amazing opportunity to open the Chick-fil-A’s doors for a special reason. Elijah Sprague of Mobile, Alabama had a big wish for his birthday this year and Chick-fil-A made that come true. Elijah is a 14-year-old boy with autism who has been bringing joy to his fellow citizens for his past couple birthdays. Elijah loves getting to work at stores around town especially drive-thrus. For his 14th birthday, his uncle got together with the manager and owner of the restaurant to plan a special day for Elijah. 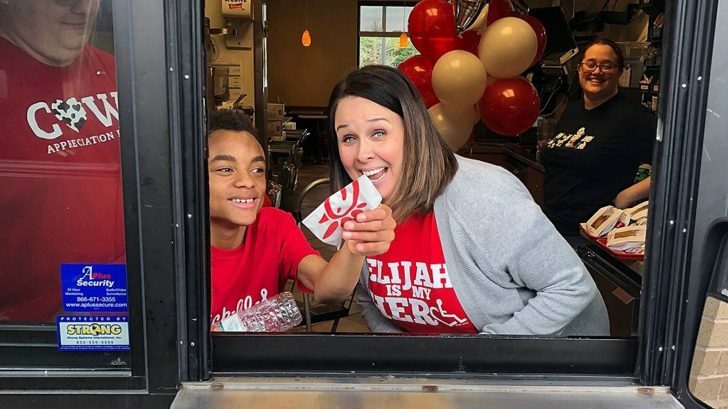 On January 13th, the Alabama Chick-fil-A let Elijah run the drive-thru window where he passed out cookies to all the cars that came through. After he had his drive-thru fun, they all went inside and celebrated Elijah’s birthday with a cookie cake! His mother, Rene Sprague, responded to his big day. What a special day Elijah had thanks to his local Chick-fil-A! It’s truly a beautiful thing to see a community come together for such a sweet occasion. We can’t wait to see what drive-thrus Elijah gets into next! It’s no doubt that we’re thankful for Chick-fil-A, but this year the chicken joint thanked its customers in a unique way too. Check out the video below! We had a lot to be thankful for this year…most of all you!